Tim Gilmore still haunts Public School Number Four. One year after the release of my book This Kind of City, which includes my story about the Annie Lytle School, Public School Number Four, someone sent me a photo of my name written with spray paint on a wall over the stairs in the school. 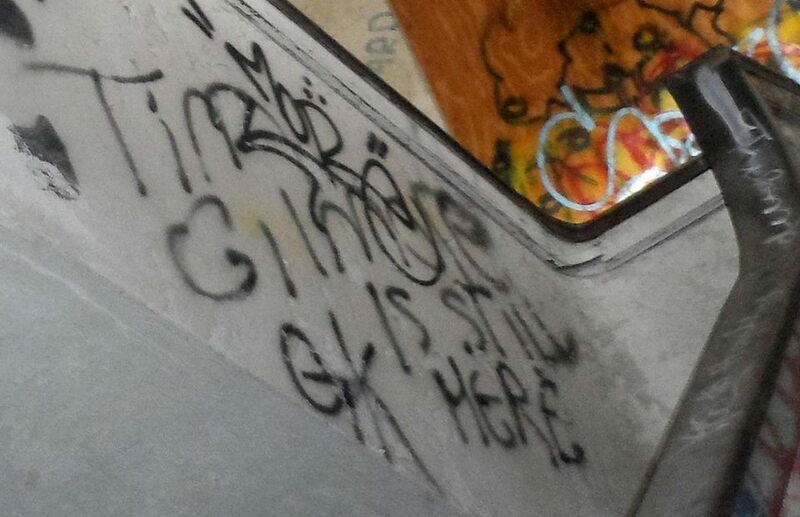 In a community cleanup effort to remove graffiti and trash from the premises of the abandoned building, the first thing this person saw was the message, “Tim Gilmore is still Here.” The cleanup took place on my daughter’s and mother’s birthday, August 24th. Strange to find my name is on a wall inside a sealed-up building. What does the message mean? Do I haunt the old school building, unbeknownst to myself? Who is this “Tim Gilmore”? It’s not necessarily a person with my face. It’s a name and a body of writing that connects to the hidden and secret places in the city. Maybe the Tim Gilmore of This Kind of City is still there, inside the school, and what he does there is a mystery to the person who wrote him and who continues to use his name for books like Ghost Compost and Stalking Ottis Toole. I say this because seeing my name on that wall feels like seeing my doppelganger in a place where I wrote him but did not know he still haunted.